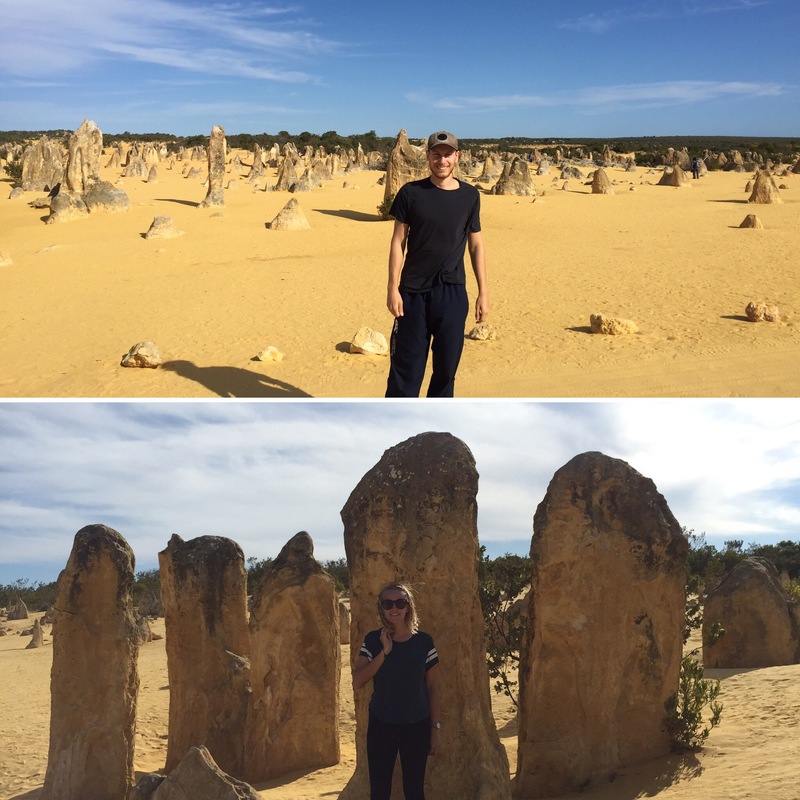 Our road trip was coming to an end, with only a couple of days left before we would make it to Perth. 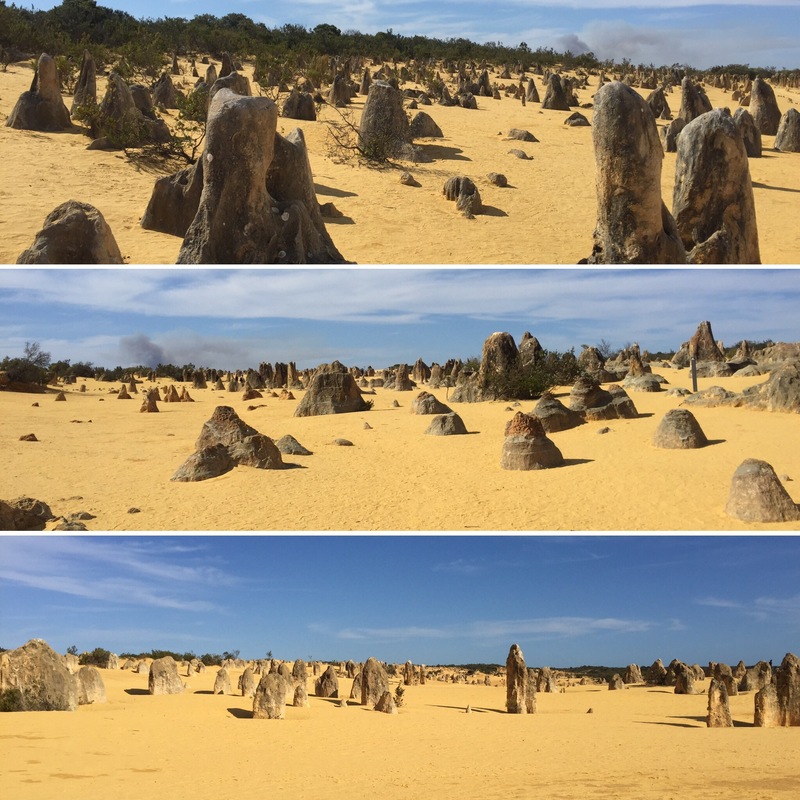 Despite a lot of driving we had seen some amazing things and it had been great to have the opportunity to see this part of Australia. 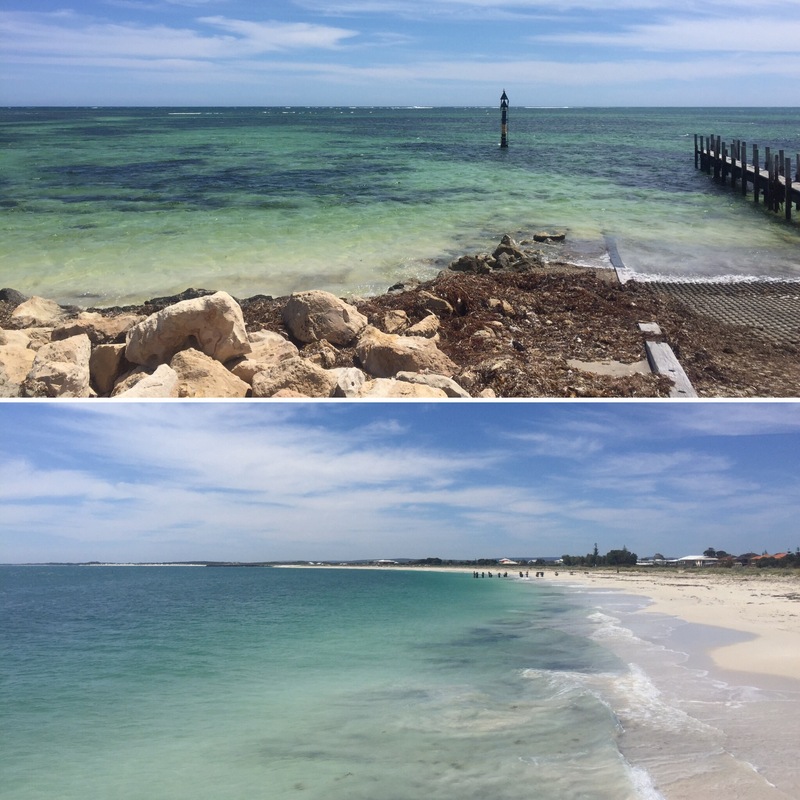 On Monday 9th October 2017, we left Geraldton where we had spent the night and headed along the Indian Ocean Drive which would take us almost the whole way back to Perth. A lot of that day of driving involves stopping off in small seaside towns and taking a look around before moving on. These places can get very busy during school holidays (just like seaside places in the UK and probably all over the world) but when we went the holidays had ended and so a lot of these places were very quiet. 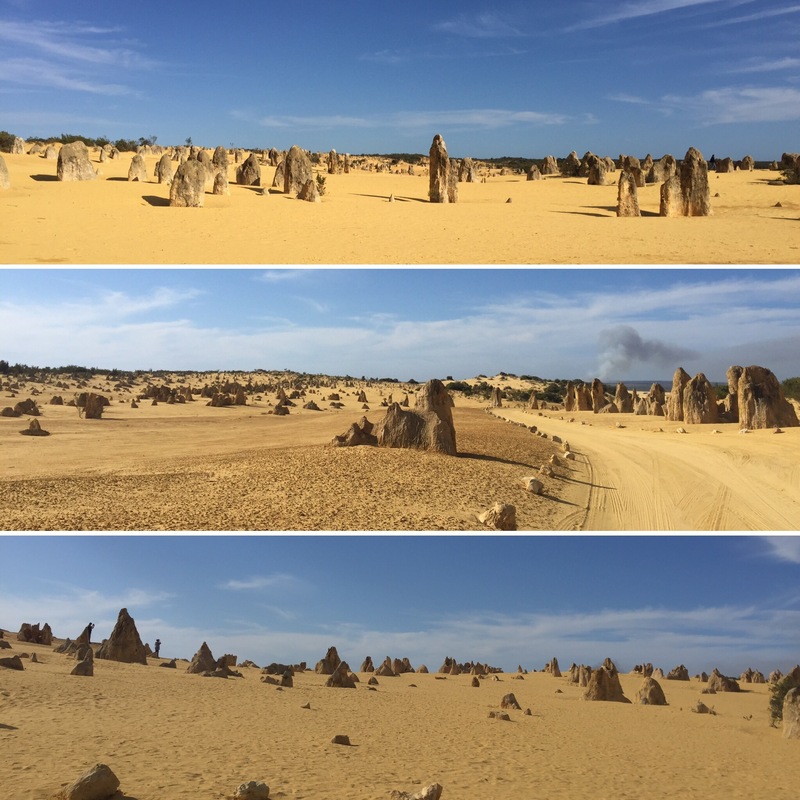 The main thing we had planned after leaving Geraldton was to go to the Pinnacles Desert. 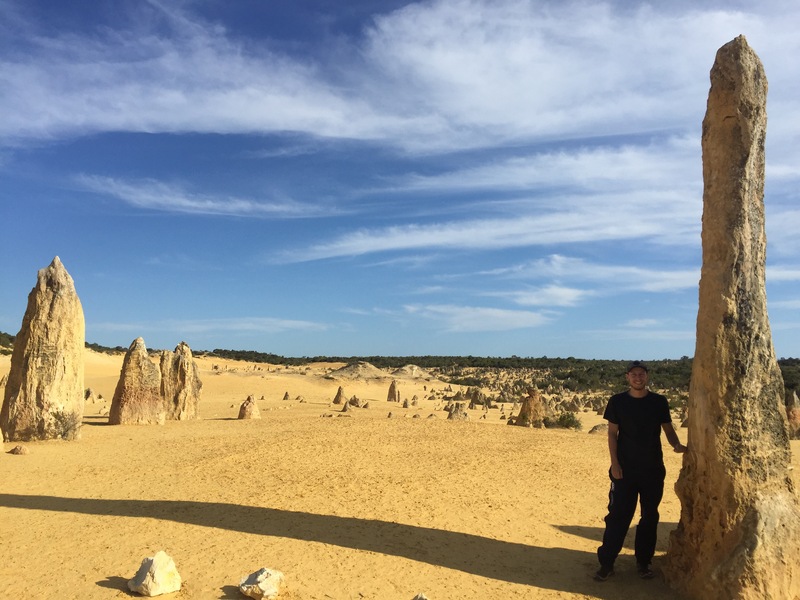 This place was really cool and has been set up really well for looking around (even if you’re just going to be in Perth and can hire a car for a day or two it’s worth driving the couple of hours up to see this!). You go inland from the coast and reach an expanse of yellow sand dotted with an array of different sized and shaped rocks. What is really remarkable is that you can look out over the desert and then see the forest and the sea all reasonably close by! You are able to park in the carpark and then follow a trail through the desert on foot through the range of rocks that are present here. 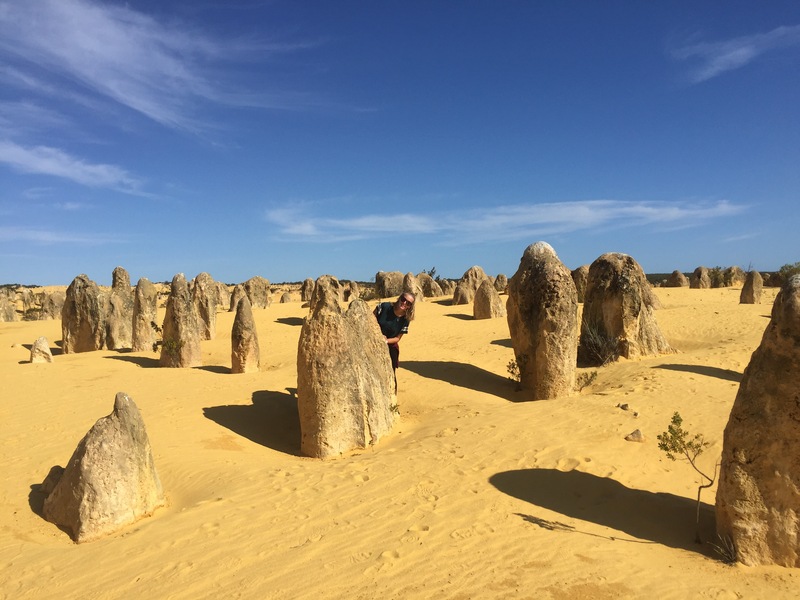 Another option (not that it has to be an either or – we did both) is to drive the outlined path through to the edges of the desert which allows you to see a bigger range of Pinnacles with a number of parking points to get out and have a walk around and take some pictures. We spent a couple of hours here and were really surprised by the height some of the rocks reached as well as the sheer expanse of the whole place. We had a little while before the sun set and would be camping in a random rest area along the highway to save money (more places than we expected charge to stay in their town which was something we were trying to avoid where possible). We headed to Kangaroo Point as the sun would be setting soon and that meant it would be a good time to see kangaroos. 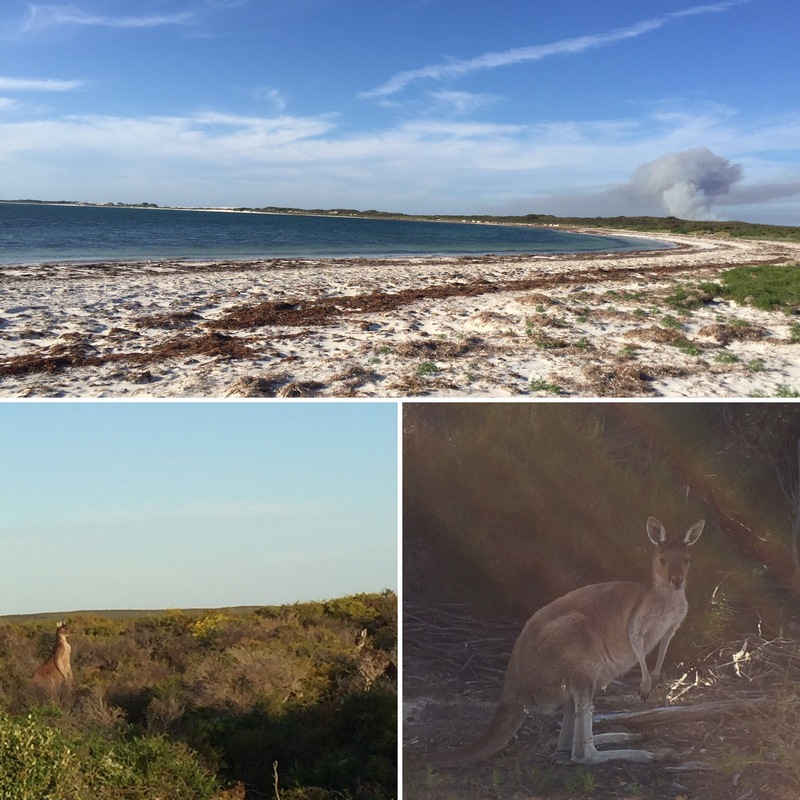 We didn’t have much luck whilst there as the kangaroos have a large area of marshland and bushes to stay hidden amongst instead of going out onto the more open, sandy areas but the place was still very nice to see it. We had more luck once we were leaving the area as there were a number of kangaroos along the road that stopped to let us have a look at them. It was then that it hit us how we wouldn’t see kangaroos in the wild anymore which was a sad thought as it never got old for us and we thoroughly enjoyed it every time we were lucky enough to have an encounter with one. 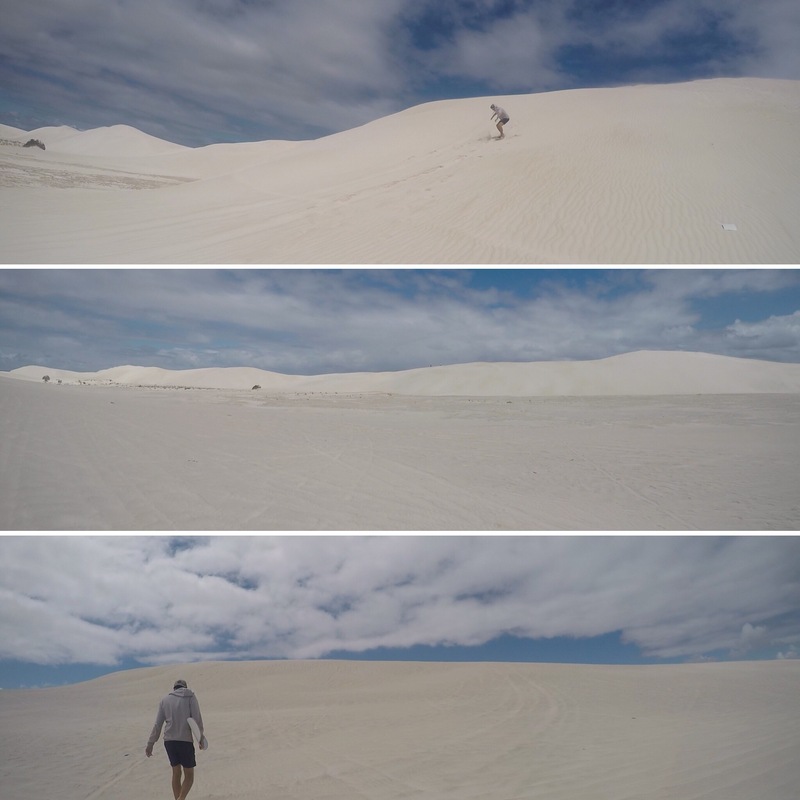 On our penultimate day in Australia (not including the day we flew as this was spent solely in the airport) we headed to a place called Lancelin. 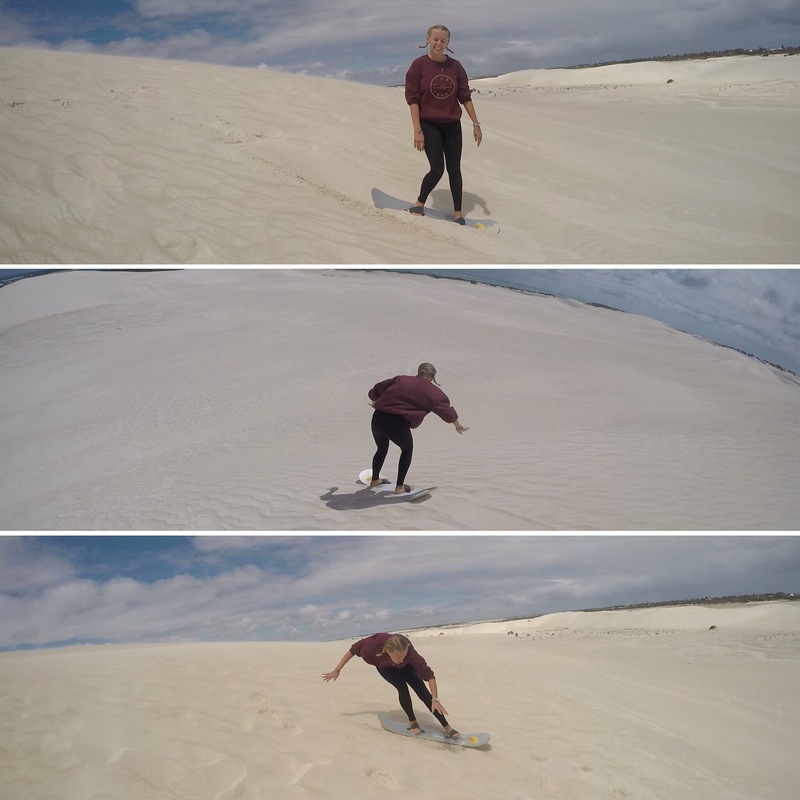 This was on the road trip map for the giant sand dunes they had here and for the chance to hire cheap sandboards and ride the sandy slopes! 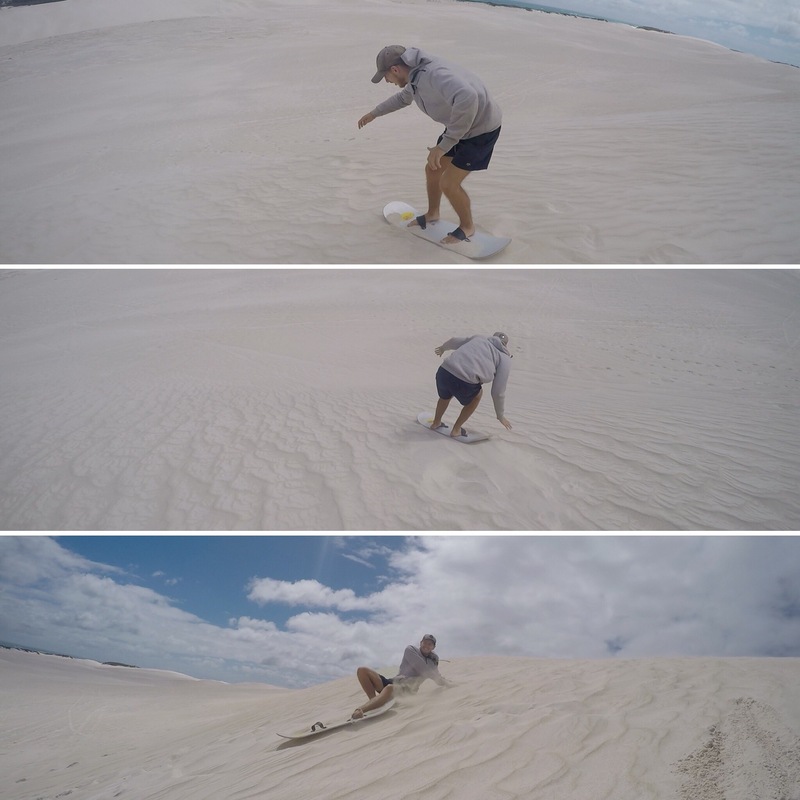 The first thing to note about sand boarding is that it’s a lot harder than you’d expect! 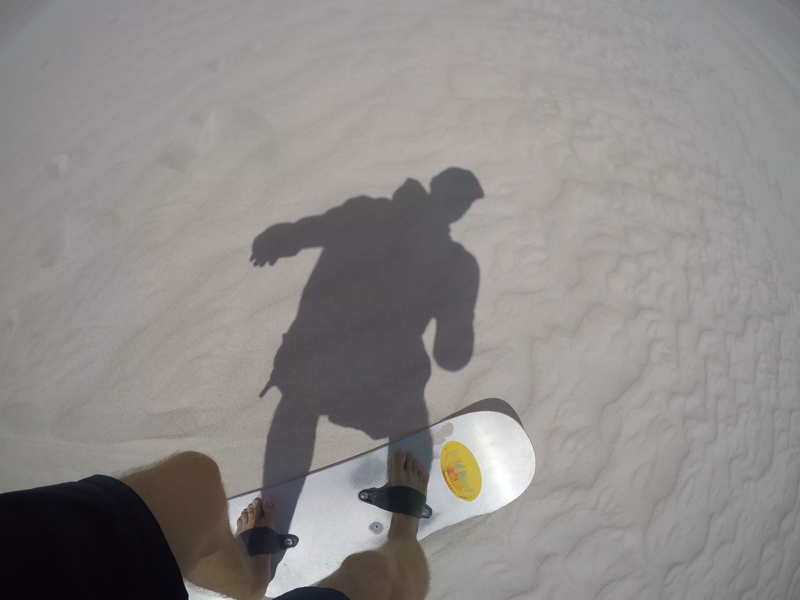 I think we both had this image of sliding down the sand dunes looking really cool and being really good but it was actually quite hard to even get the boards to slide and then to stay upright until you reached the bottom was another thing entirely. It had been raining that morning so I don’t know if that made a difference to the level of difficulty but it was also very windy and so we had sand in our eyes, ears and through every layer of clothing by the time we were done! 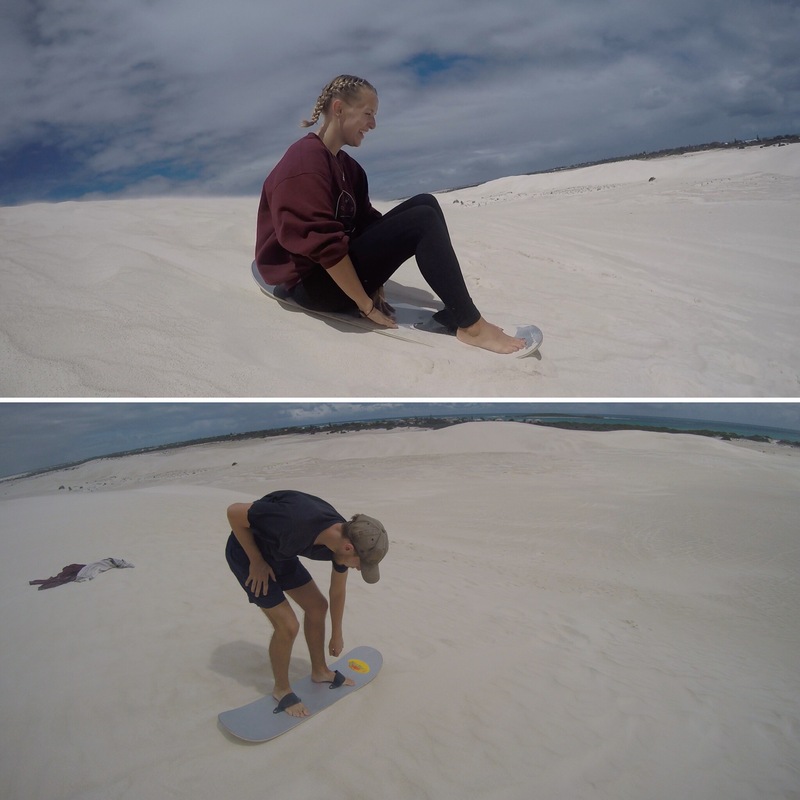 I found the sand boarding slightly easier than Niall which doesn’t often happen (maybe because I’ve been skiing more often than him – I don’t know) but neither of us were winning any medals for our skills. 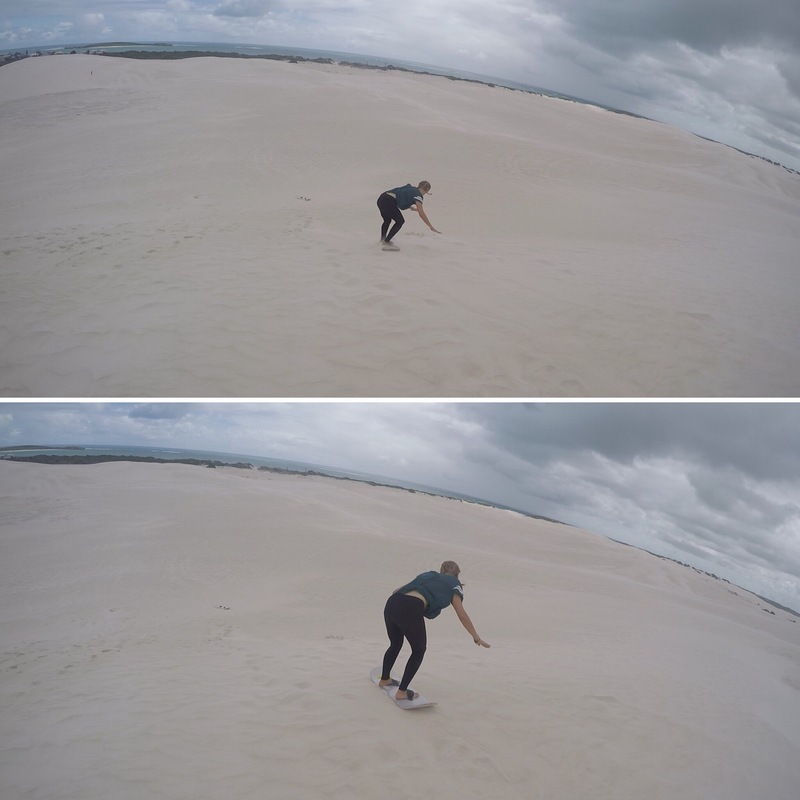 It was cool to do though and probably just takes a lot of practice and someone to give you some tips before you start flying down the sand dunes in style! The next morning we had to get our rental car cleaned and returned to Travellers Autobahn and then get into Perth to pack and get ready to leave Australia. We had managed to find a hostel for $12 each (called the Hive) which is an unheard of price in Australia and was half of what we had been paying living in Brisbane! Our final evening in Australia, on the 11th October 2017 (we flew to Singapore the next day on the 12th), was spent the way our first night in Australia had been spent. 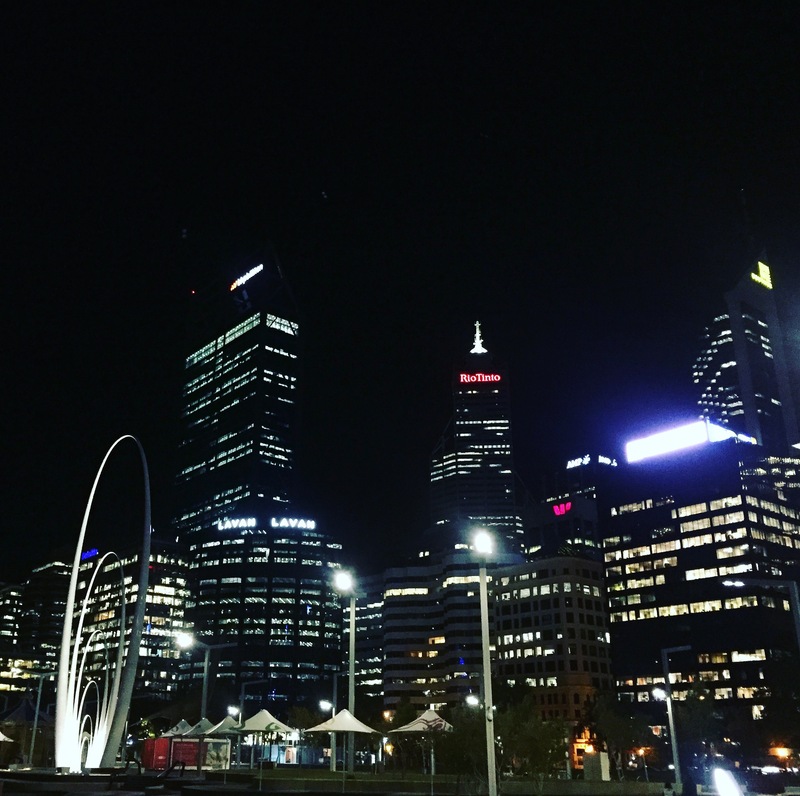 We headed to Elizabeth Quay which is on the waterfront and had a beautiful backdrop of the Perth CBD and ate Pizza Hut pizza. It was great to walk through Perth again having been there just under a year earlier and we still like it as much now as we did then. It felt really fitting to end our time in Australia back at the beginning and we couldn’t have been happier with how our time here had been. We had been lucky enough to see pretty much the entirety of the country and Australia hadn’t disappointed in the slightest. I think a lot of people see Australia only for their beaches and surfing but that is far from the case. Yes, it has beautiful white sandy beaches and turquoise coloured sea on both sides of the country but it also has mountains, national parks, deserts, waterfalls and a vast array of wildlife as well as a handful of lively, vibrant cities to explore. We couldn’t recommend Australia enough and it’s been a fantastic place to spend the majority of our time during this trip. I hope it won’t be the last time we are there. Until next time, Australia! But for now, it’s time to head into Asia.